In college my friends and I had a slight obsession with Quaker® Oatmeal Squares. It really intensified when we moved off campus senior year. I don't know what it was but for some reason this often seemed to be the only thing we had in our pantry besides boxed mac & cheese. We would eat them for breakfast, lunch, dinner and even a late night snack after a night out. When someone would question our decision to eat Quaker® Oatmeal Squares at odd hours my friend Kath would always say "Whole Grains" as if that was the answer to any question. In fact even though I hadn't purchased them in a while I could still see the front of the box with the wording about whole grains clear as day. Now that I am out of college, I still eat cereal for meals/snacks other than breakfast. 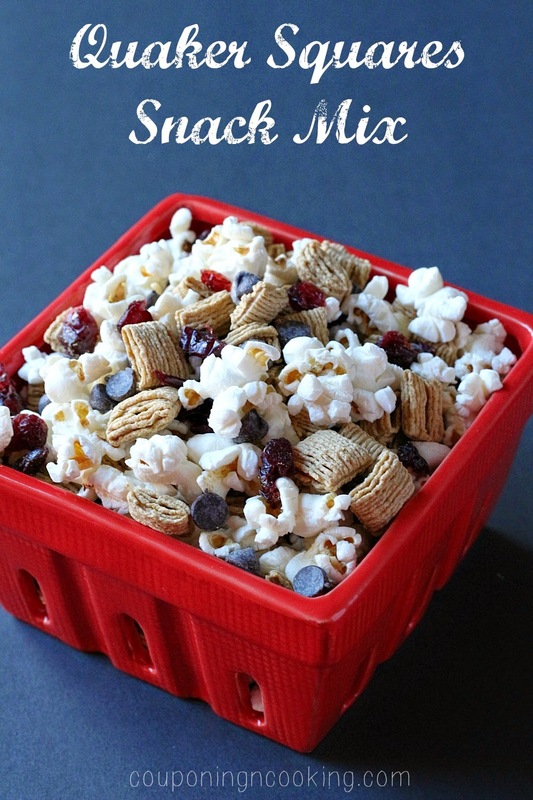 With my job as a teacher, I am always on the go and feel like I am always trying to find snacks that are easy to make and pack but fill me up too. 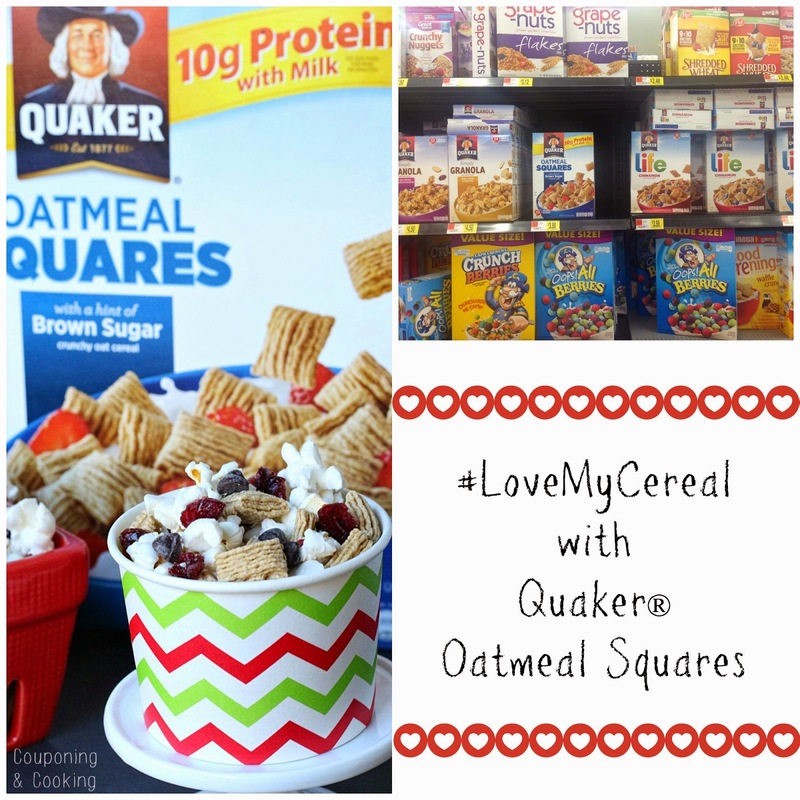 Recently I have been making a Quaker® Oatmeal Squares Snack Mix that I am in love with. 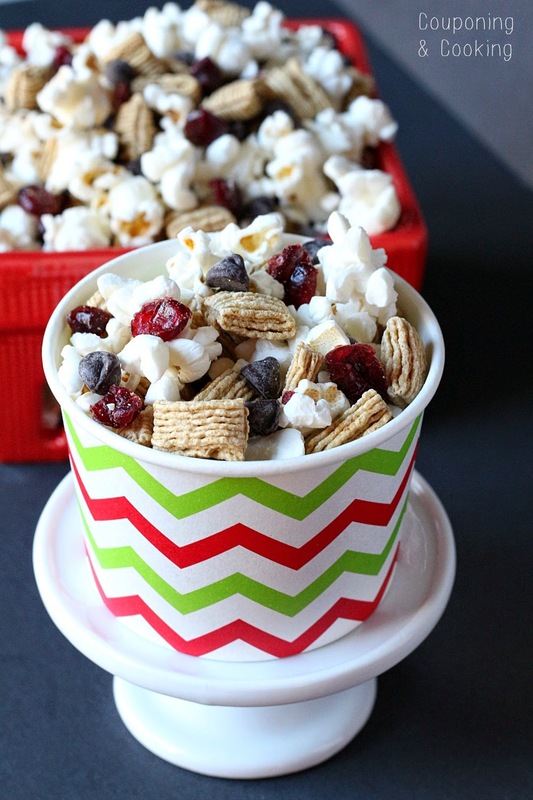 It only has four ingredients, all of which can be easily found at your local Walmart: Brown Sugar Quaker® Oatmeal Squares, air popped popcorn, dark chocolate chips and dried cranberries. It is the perfect mix of crunchy and chewy, sweet and salty. I have been making it for a snack for myself but recently I put some out at party with family and friends and my mom loved it so much she took home all the left overs and then called the next day asking for more. It travels easily, fills me up and satisfies all my different cravings at once. 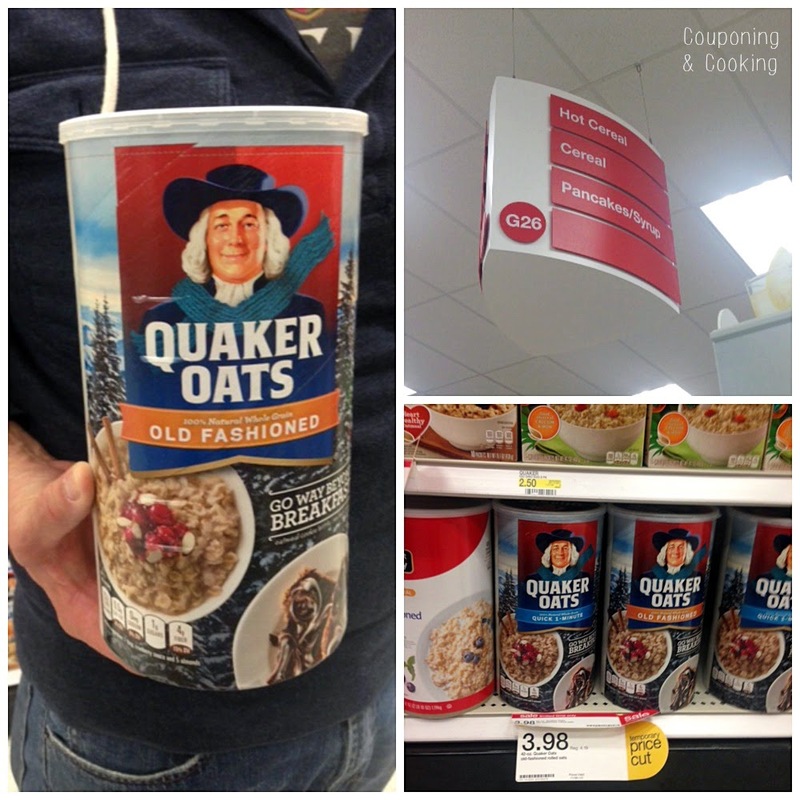 It can easily be modified depending on what you have on hand or what Quaker products are your personal favorites. I used the Brown Sugar Quaker® Oatmeal Squares but you could switch it up and use Quaker® Real Medleys®, Quaker® Simply Granola, Quaker® Life, or any other variety of Quaker® products too. Mix all the ingrediants together in a large bowl. Store in individual serving plastic bags or in a large air tight container. Best if eaten in a few days of making it. I would like to think that I am pretty experienced when it comes to throwing parties. Justin and I love to entertain and ever since we have been engaged we have thrown an annual holiday party and big end of summer BBQ. In early years our parties were pretty basic. Chips and salsa, burgers and hot dogs, maybe a veggie tray if we were feeling crazy. As the years have gone on, we have continually felt the need to step it up as we get older. Better food, classier decorations, a wider selection of drinks were all on the menu this year. Now that we are 30 and basically adults, I wanted to take our food, especially our appetizers, to a whole new level this year. 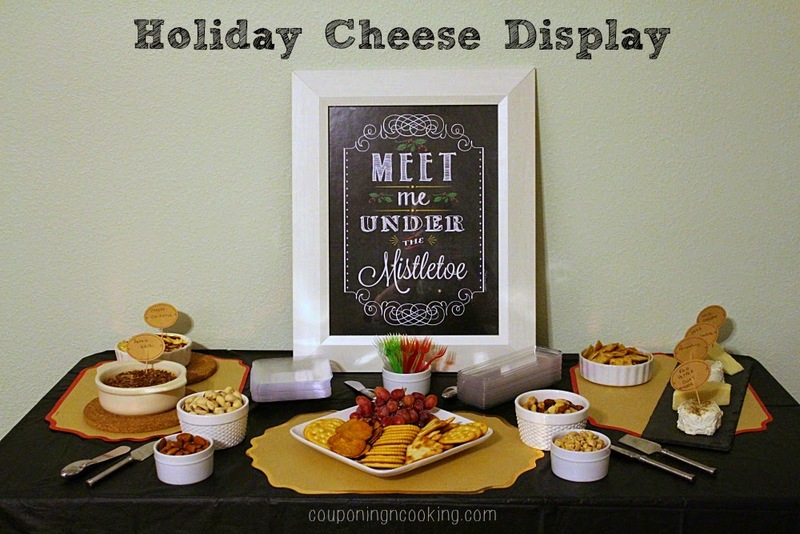 Cheese is always the star of the party in our family so I decided to go with a cheese display as the focal point of the appetizers. It turned out perfectly- easy, classy and a huge hit with family and friends. Even with over 30 guests this display fed everyone easily. The variety of crackers was great because it allowed people to pair the various cheese and dips with different textures and flavors depending on their preferences. I loved that all I had to do for most of the display was set out the items a few minutes before the party. To save time and stress, I actually pre-set up the entire table minus the refrigerated items and pre-made the dip and brie earlier in the day. 30 minutes before guests arrived I put the dip and the brie in the oven so that they would be the perfect temperature when every got there. The dips went quickly but since it wasn't too hot it was nice to be able to leave out the cheeses, crackers, nuts and fruit so that people could snack on them even after dinner was served. 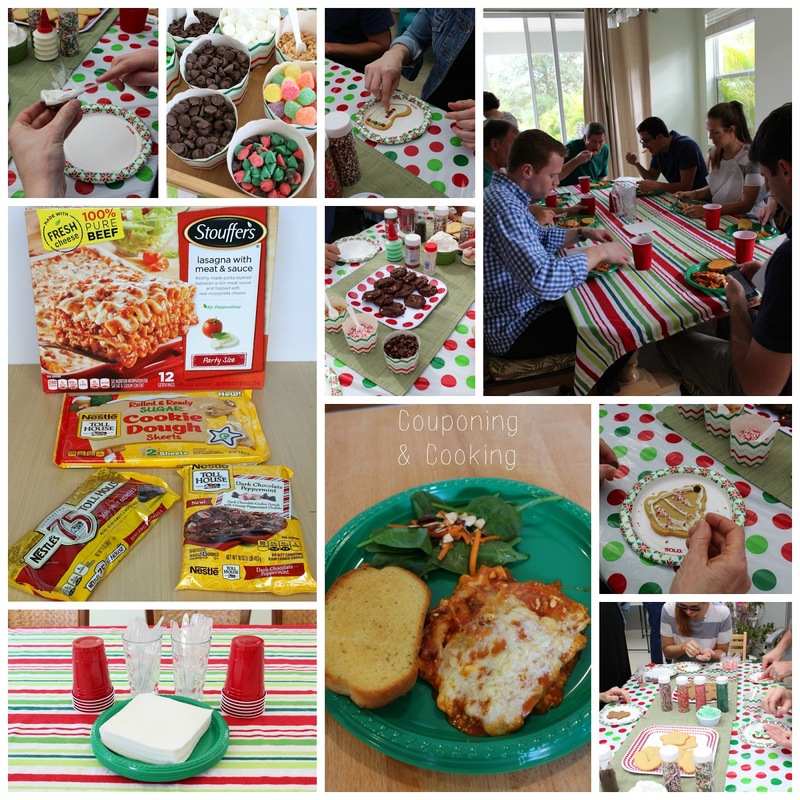 Pretty much everything you see tablescape wise in these photos was purchased at Target either this year or during last year's after Christmas clearance sale. 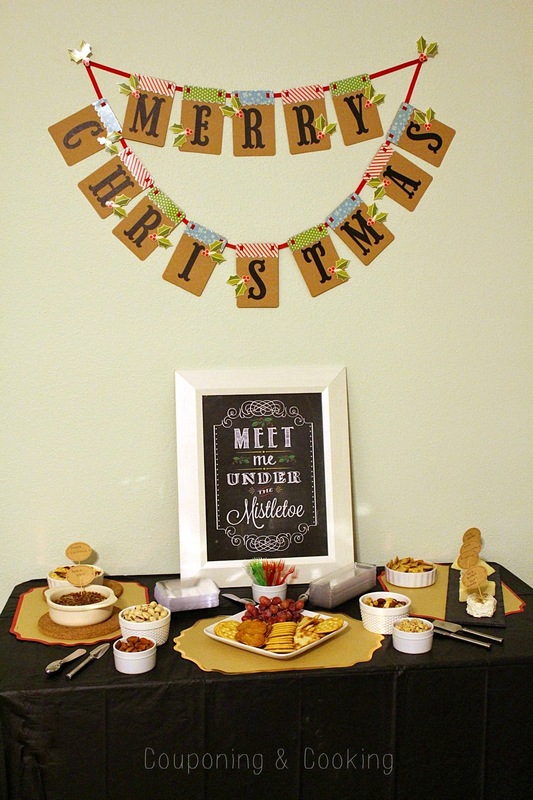 The hanging sign was a DIY kit that was actually surprisingly easy to make and the plates, paper placemats and food labels were all found in the holiday entertaining section. 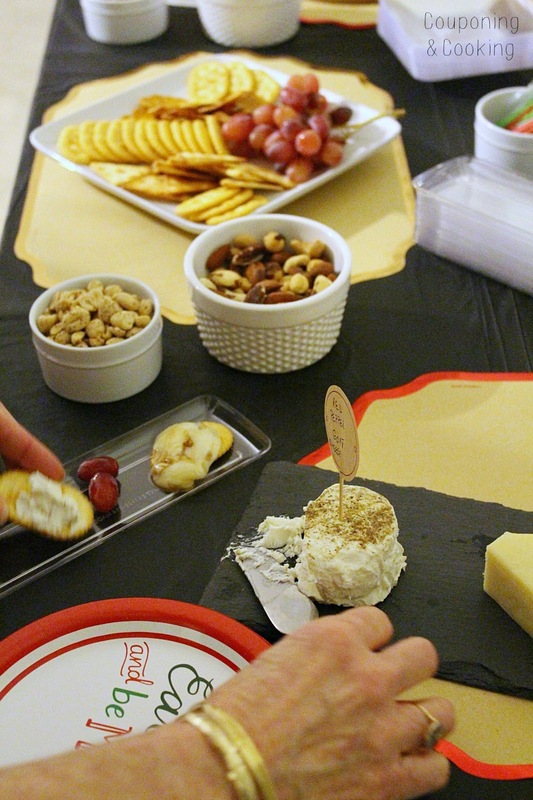 I got the little clear tapas plates as a nod to the mini cheese plates we had at the Epcot Food & Wine Festival this year and I love how cute they looked when guests made their own little plates. Justin and I consider ourselves to be "tapas" people and often eat our own mini versions of this on our at home date nights so the cheese display was a natural, larger extension of that (minus the dip and baked brie of course). 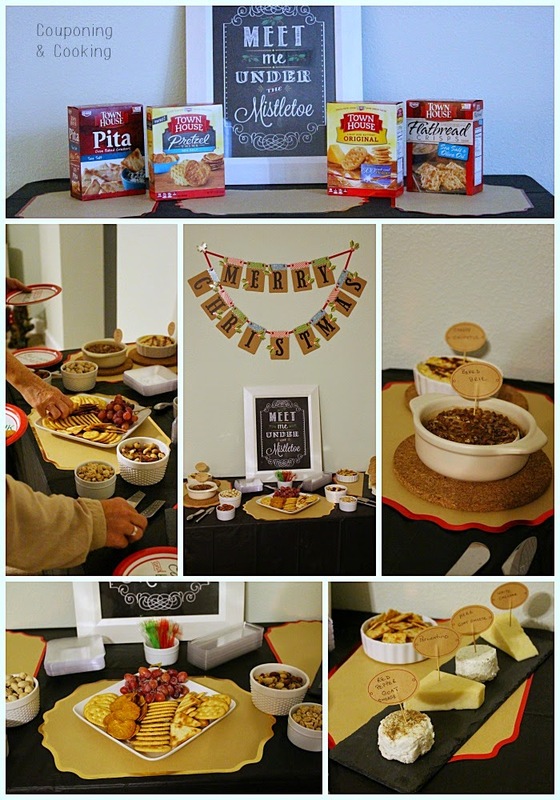 I love how simple yet so filling it all is and I really feel like it added a nice touch to this year's party. And if my guests have anything to say about it, I imagine it will make an appearance at future parties as well. My favorite thing on the display had to be the baked brie. I love how easy it is to prepare when it looks like something complicated. 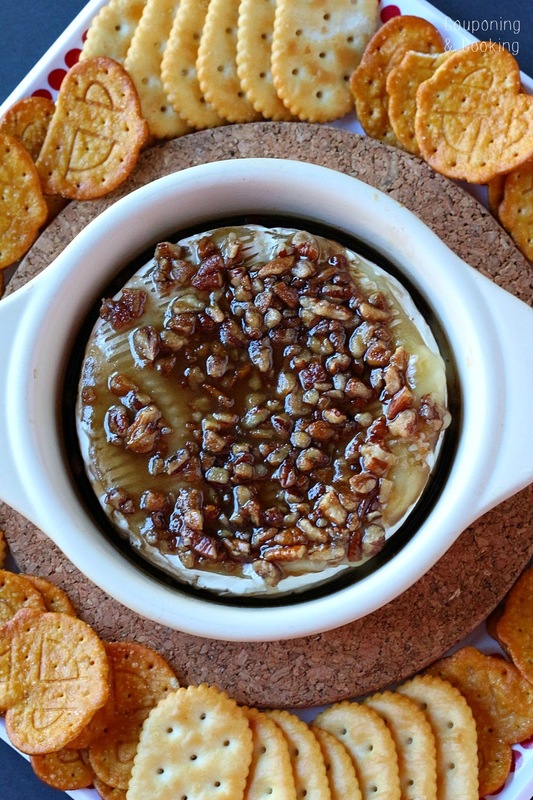 You can adjust the ratios depending on how you like your brie but I try to stick with a 3-2-1 ratio of brown sugar to pecans to rum. Personally I prefer the traditional, butter Town House crackers with it but a lot of our guests paired it with the pretzel chips this year. 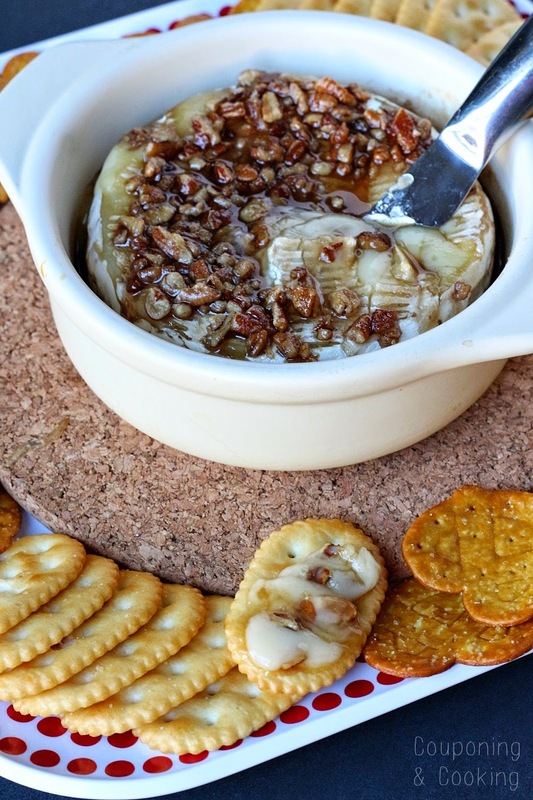 What are your favorite holiday appetizers to serve each year? 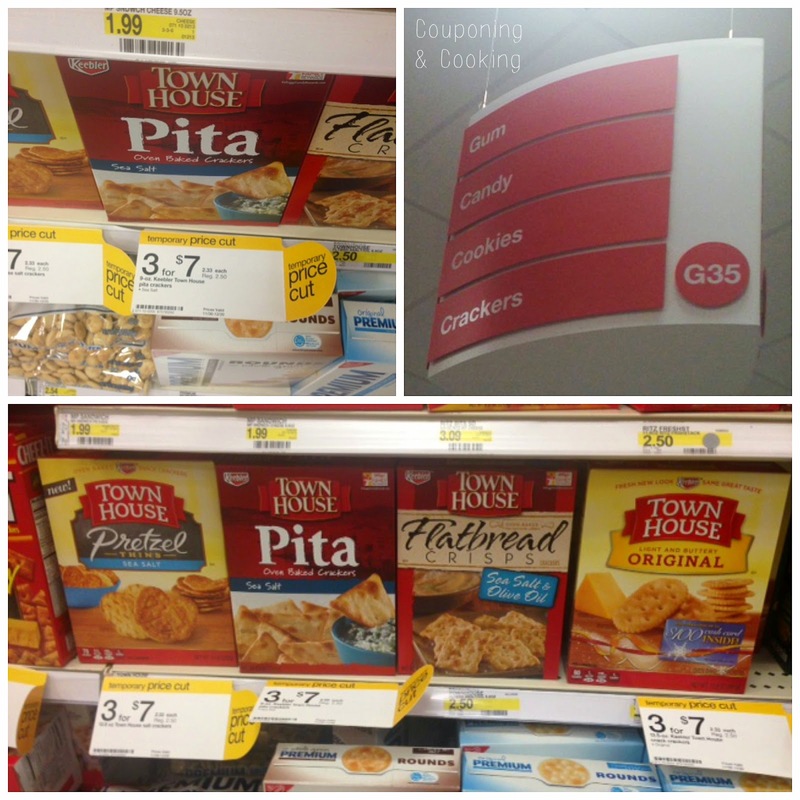 Do you have tried and true family favorites or do you mix it up? I would love some new ideas so be sure to share in the comments! 1.) Remove the brie from the wrapping and using a sharp knife shave off some of the rind on the top. This makes the cheese easier to spread once it is heated. 2.) In a small bowl, mix together the brown sugar, pecans and rum. 3.) 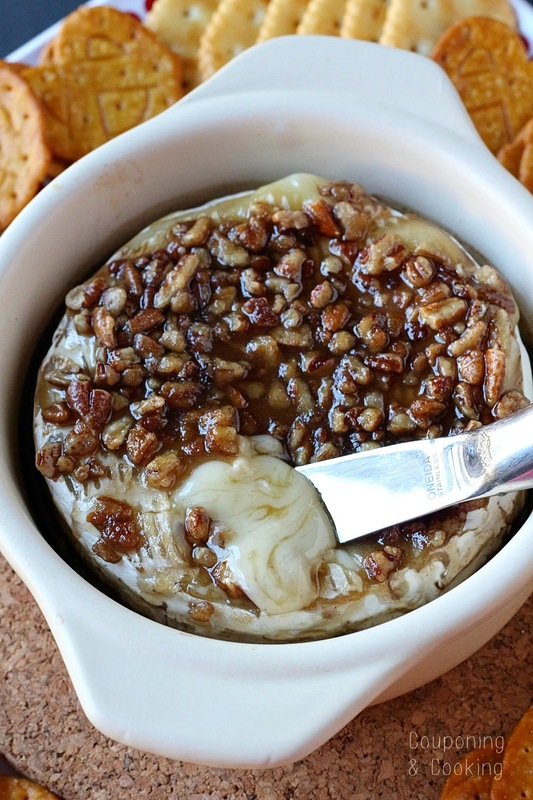 Place brie in a small baking dish or brie baker if you have one. Top with the mixture. 4.) Bake covered for 10 minutes at 375 degrees. Uncover and bake for another 10 minutes or until sides are bubbling and cheese looks melted. 5.) Serve warm with crackers. Be careful about serving this too soon, the sugar mixture can get very hot so be careful. When I think of food during the holidays, I don't think about turkey or stuffing or sweet potato casserole. 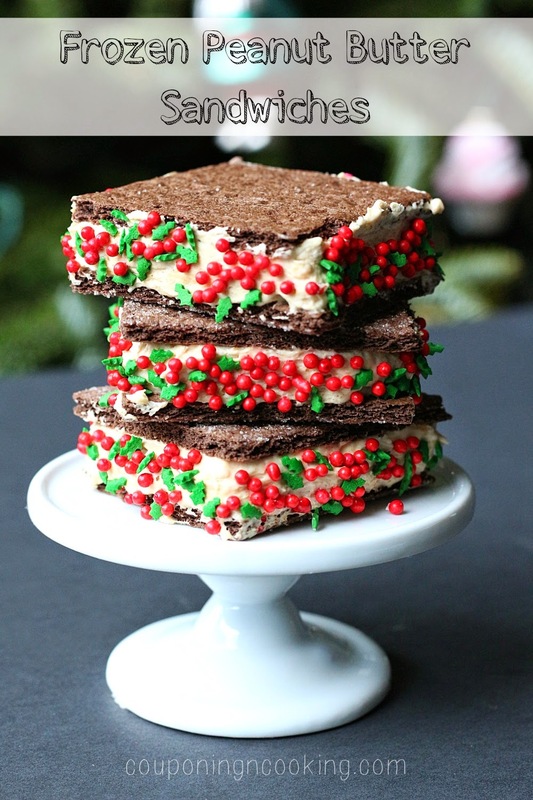 For me, the best holiday food memories center around desserts. 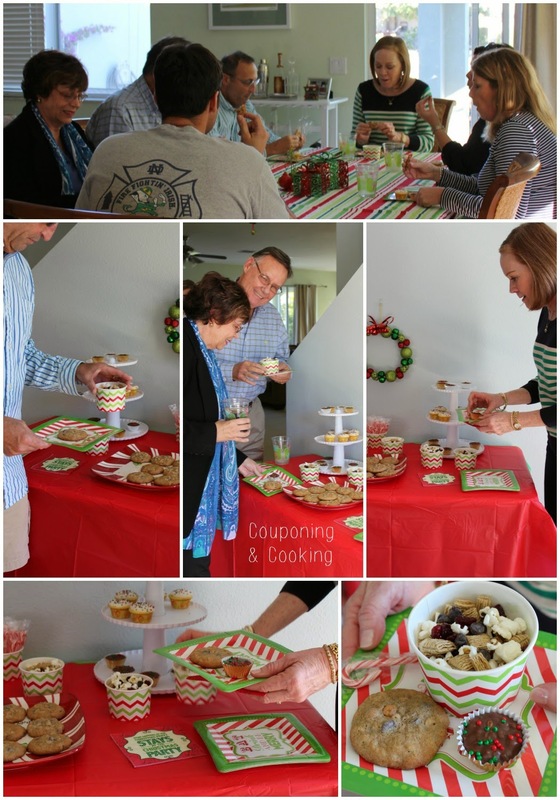 For our annual Christmas party, I always try to come up with new and different dessert recipes and this year I decided to have a "trial run" dessert party to test out a few oatmeal recipes I wanted to serve. A few family and friends were happy to help me out and be taste testers and give their suggestions on the set up of the dessert table. Since we were serving a full dinner and lots of appetizers for our upcoming party I knew that the desserts needed to be bite sized because guests tend to like to grab something small right after dinner but then head back as the night goes on for a few more treats. I have a few rules when it comes to preparing desserts for parties. It must be easy to make ahead. It needs to be something people can eat while standing around and mingling. And there must be a variety of options for all different tastes. I personally find it hard to serve things like cakes and full pies at large parties and the single serving treats eliminate the need for putting out utensils too. 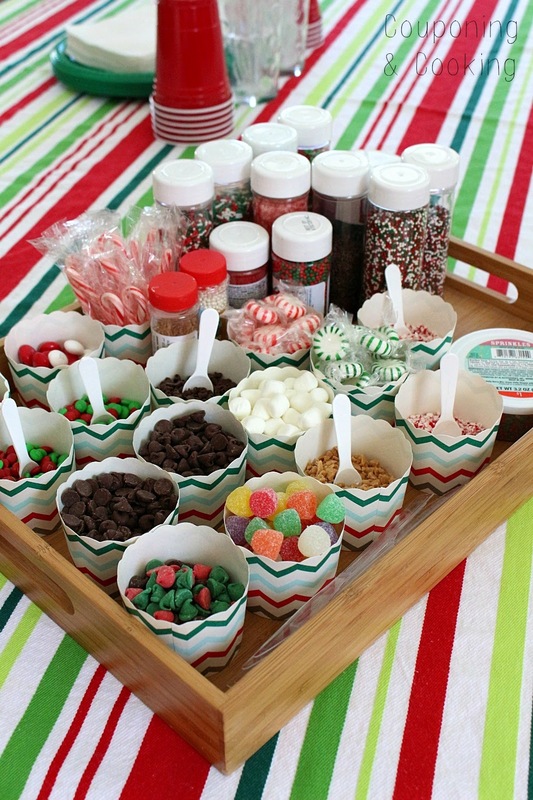 This dessert table meets all of those requirements. As will all of my parties, I went with disposable where I could. 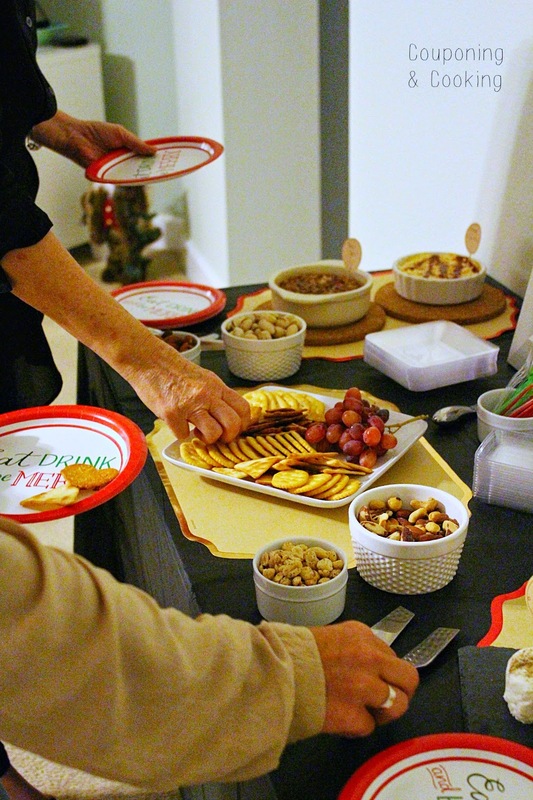 The tablecloth, napkins, plates and serving cups were all purchased last year at Target during their after Christmas clearance. Each year I go bright and early on the 26th and stock up for the following year. I literally buy everything down to the cupcake liners for my future party. 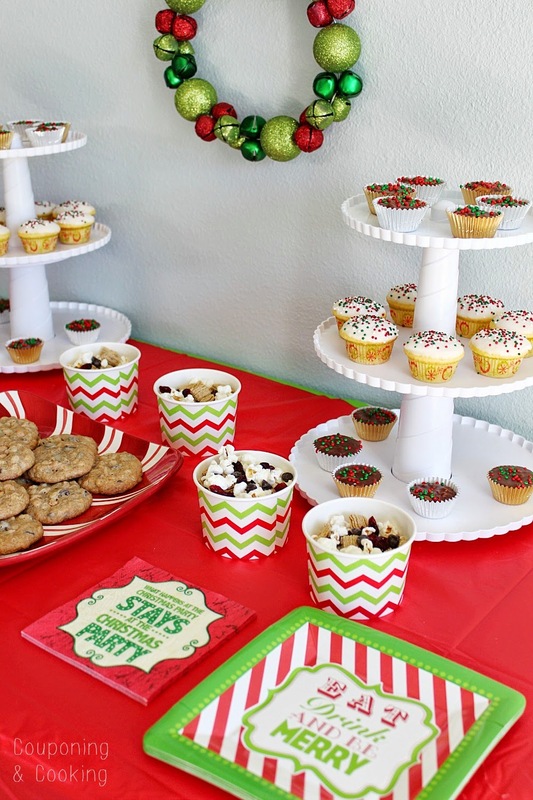 Going early means I can usually still shop with a theme in mind and as you can see this year's party featured a variation of traditional red and green stripes and chevrons. I like to add a little height to my dessert displays because it makes it easier for guests to see and reach their dessert options. 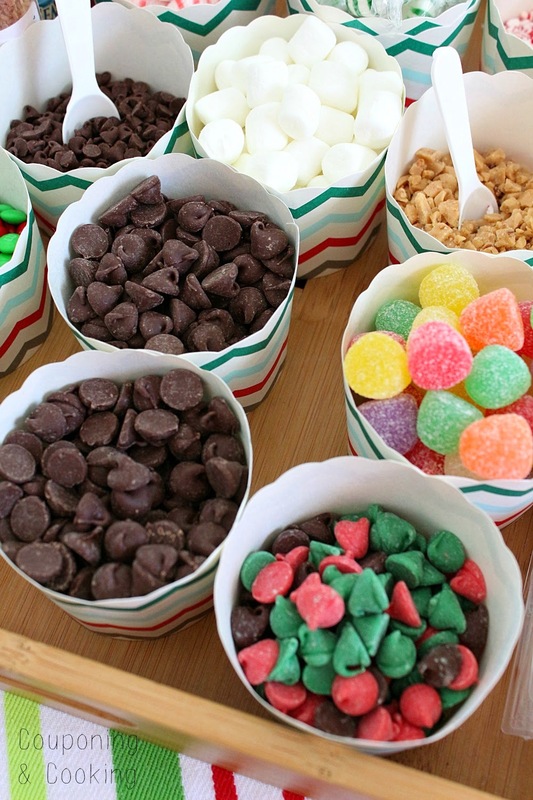 Individual cups of trail mix let guests snack on the go and then easily throw the cup away when they are done. 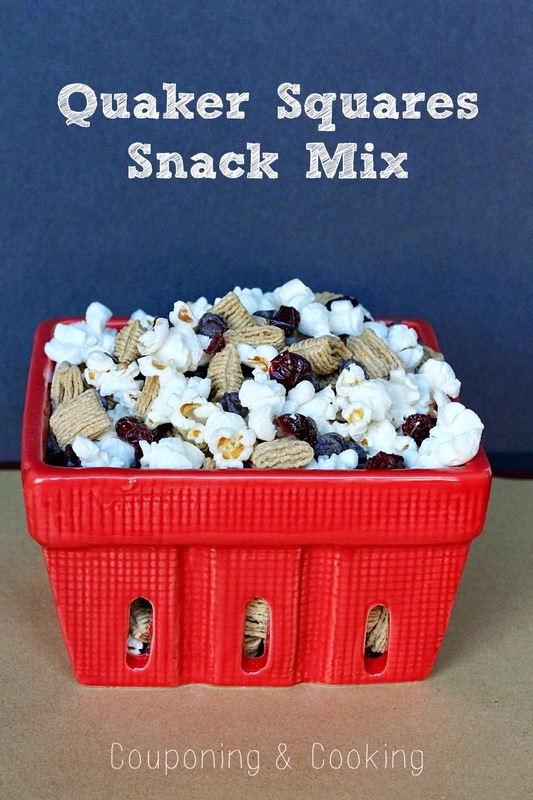 This eliminates the need for people sticking their hands into things or having to scoop it out of a big bowl which will inevitably lead to trail mix all over my floor. The Crock Pot Christmas was a huge hit this year and I have been requested to make more for Christmas day dinner as well. 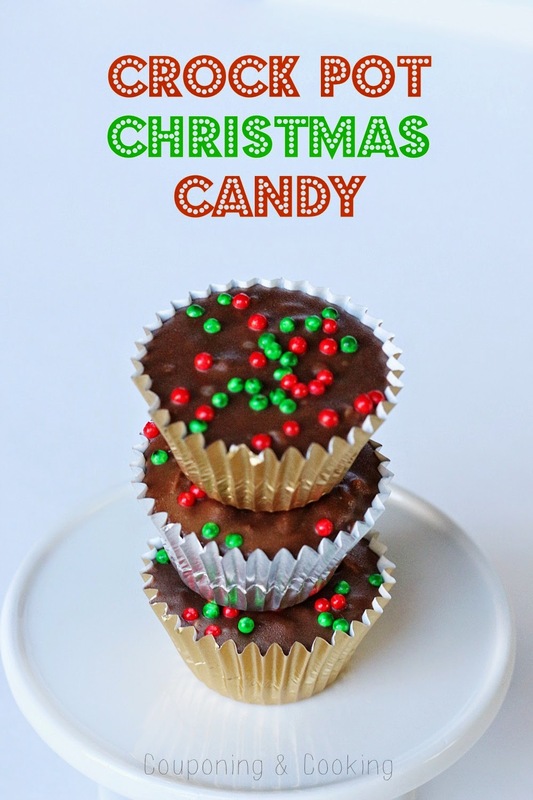 It was so easy because unlike a lot of candy recipes where you have to temper the chocolate just right or use a double boiler and risk scalding yourself, all this recipe took as throwing melting chocolate in a mini crock pot, waiting 15 minutes and then stirring in a few ingredients. You can easily modify this based on what you have on hand but my favorite combo is the one in the recipe below: oatmeal, toffee bits and peanuts. Just one of these is filling enough to satisfy even the biggest of sweet tooths. 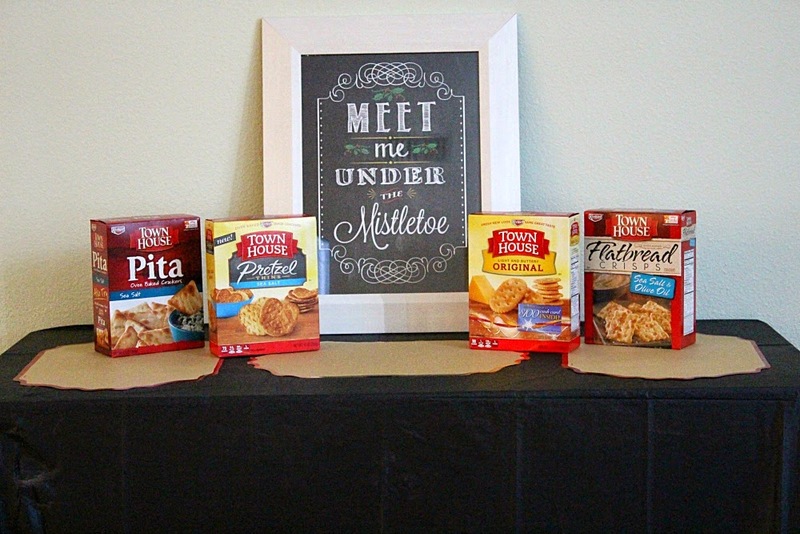 Quaker Oats are always a huge part of holiday (and year round) baking in our family and this year's special winter packaging available exclusively at Target was too cute to pass up. 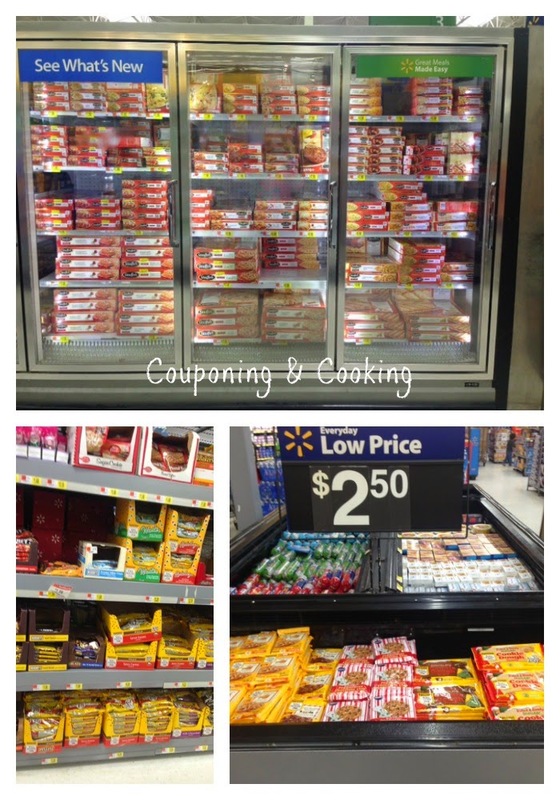 It was actually on price cut (varies regionally) and I had a great printable coupon so I was able to stock up for the season at a really good price. 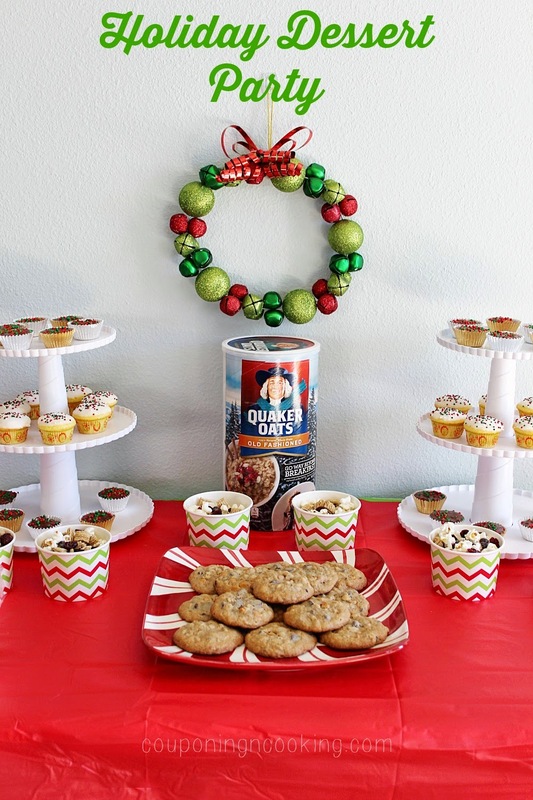 Be sure to grab some next time you are out shopping and visit Quaker on Facebook & Pinterest for even more holiday baking inspiration. 1.) 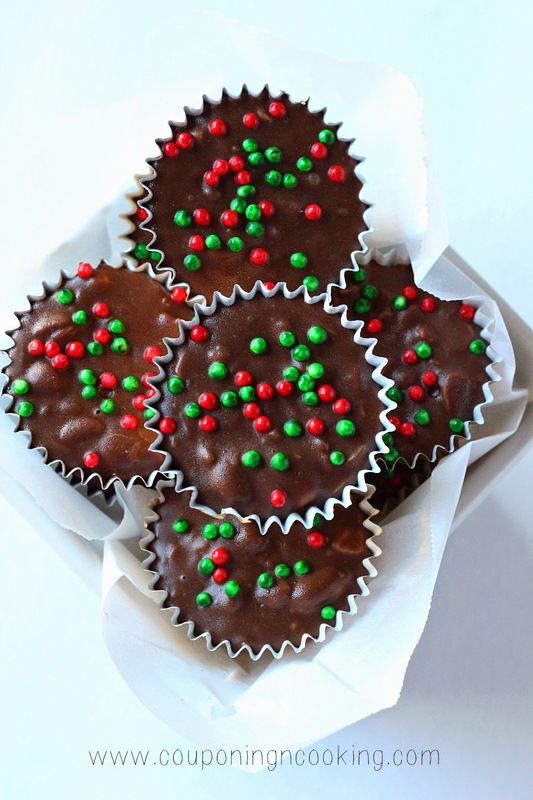 Chop up chocolate and place in a small crock pot or slow cooker. Let melt on medium for 10-15 minutes stirring occasionally. 2.) Once the chocolate is melted stir in the oatmeal, peanuts and toffee. 3.) 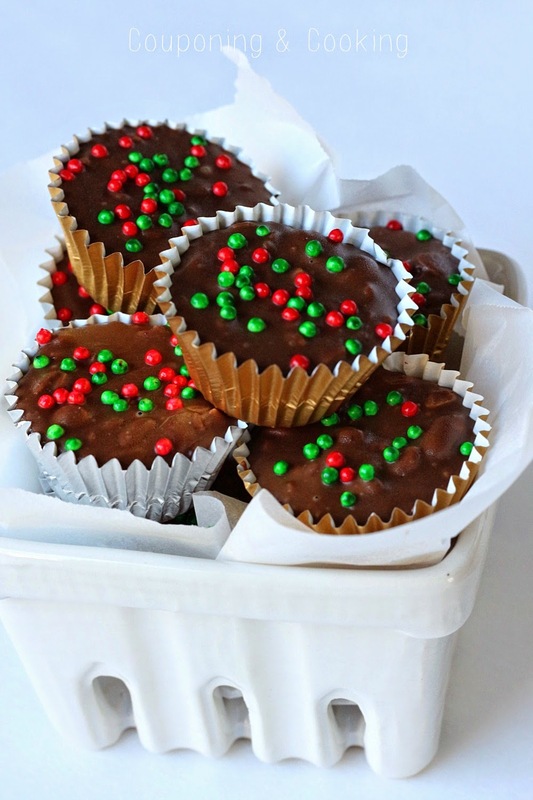 Line a mini cupcake tin and using a tablespoon or small cookie scoop, scoop the mixture into the liners. 4.) Refrigerate for at least 3 hours to let the candy harden. Can be stored at room temperature in an airtight container. When it comes to holiday recipes, I like to keep it simple. Minimal prep time, limited ingredients, and the ability to make things ahead of time are all things I look for when planing out my holiday desserts. There Frozen Peanut Butter Sandwiches meet all of those requirements and happen to taste ridiculously good. 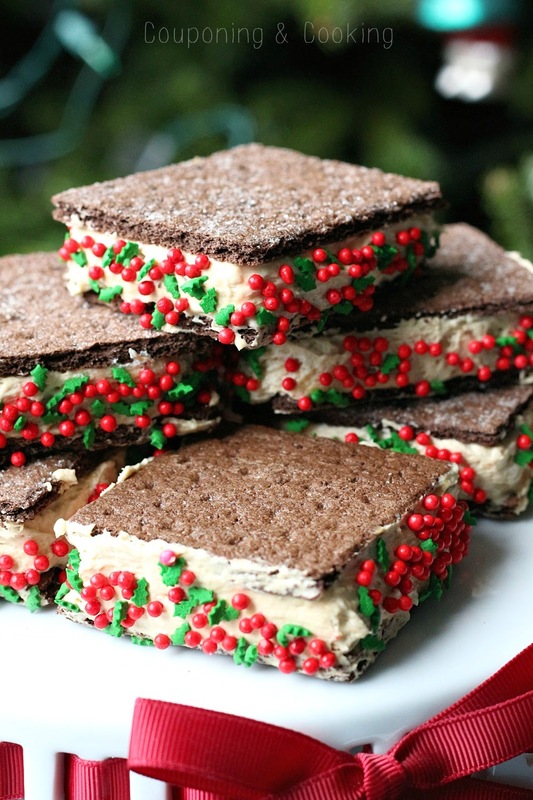 All it takes to make these are a a few Honey Maid Graham Crackers, some Skippy Peanut Butter and some Cool Whip. Add some sprinkles and after a few hours in the freezer you have an amazing and refreshing holiday dessert. And since the weather here in South Florida is still in the high 70's, refreshing is still very necessary. I don't know if I have been living under a rock or something but I have never combined peanut butter and whipped topping before. Apparently it is a pretty common thing. I cannot believe how much I have been missing out on my whole life. Justin and I could barely restrain our selves from eating it on graham crackers right out of the bowl while I was assembling the sandwiches. 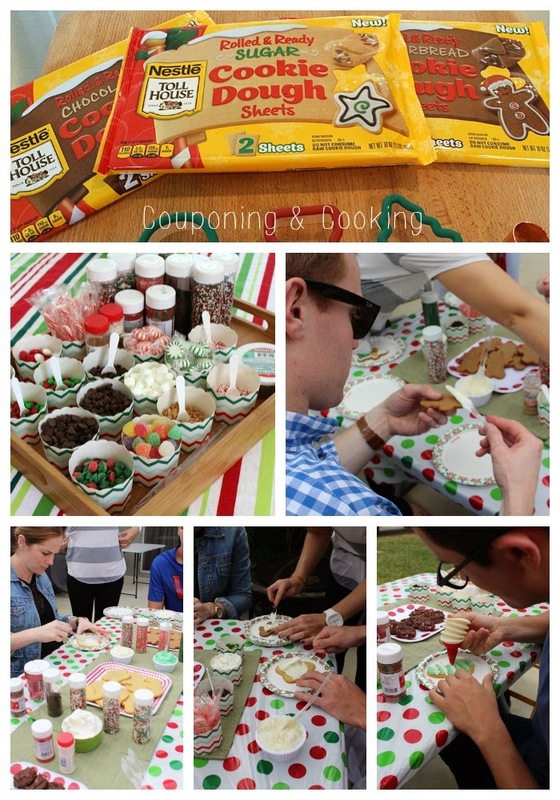 Peanut butter and graham crackers are always a winning combination and recently we had my family over for a little holiday decorating fun and we had a friendly competition of building graham cracker and peanut butter "gingerbread" houses. I love that I didn't have to bake anything for these and could just unwrap some graham crackers and put a jar of peanut butter on the table. 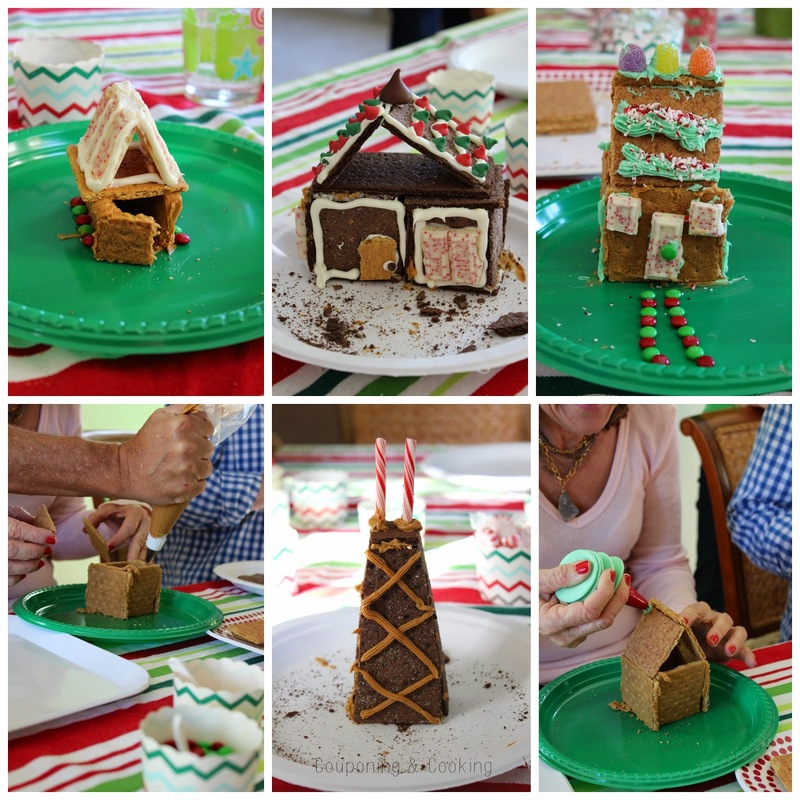 To put it nicely, my family is not cut out to be architects but we did have a lot of fun making some not so inhabitable looking structures. The one exception to our structurally challenged family would be my brother who made this amazing graham cracker and peanut butter version of the Hancock Center in Chicago where he lives. He took this family activity very seriously and clearly his work reflects that. 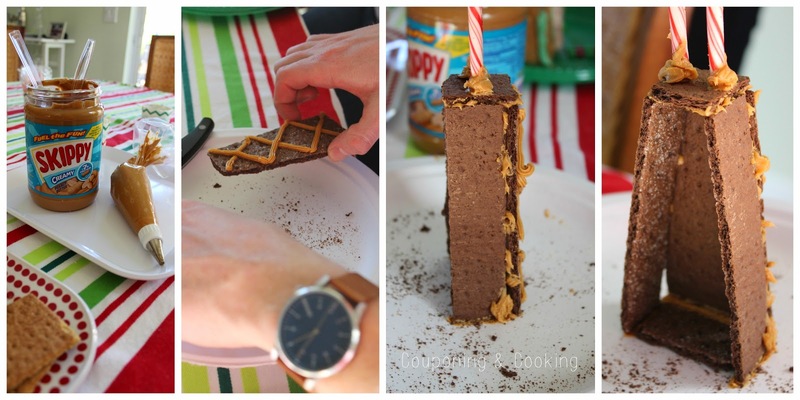 He used chocolate graham crackers and angled them with a sharp knife. 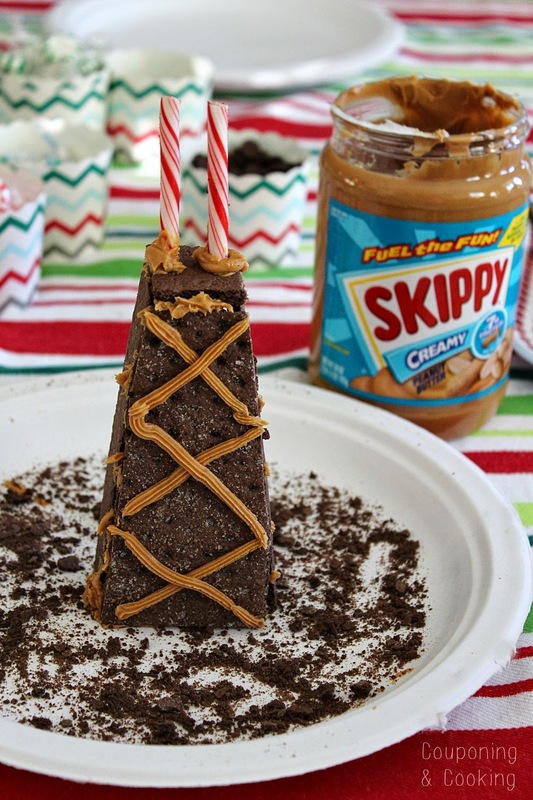 He leaned them together with peanut butter as the glue and added antenna made from broken candy canes. He referred to it as a "movie set" building since the back is open but he found that it stood up better when leaned together without a back. The peanut butter made for the perfect glue and the building stayed upright for a few days. As you can see below the rest of our family made some creative things as well. Our friend Aaron made a little dog house for her dog, Quincy. Justin's Aunt Lindzey made an adorable chocolate house and my Aunt Maria made what appears to be the cottage from Hansel and Gretel. 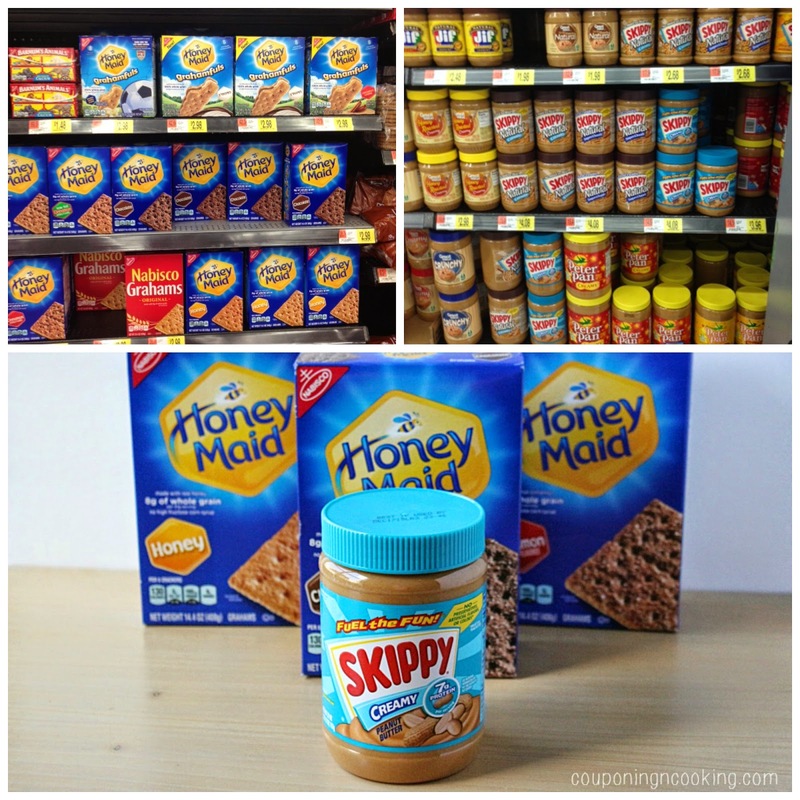 Looking to make your own graham cracker and peanut butter houses this holiday season? Be sure to stop by Walmart and pick up everything you need. Right now you can save $0.50 when you buy one (1) Honey Maid Grahams (12.2 oz. or larger) when you print out this coupon too. Want to save even more? Currently the ibotta cash back app has a .50 cents rebate on any box of Honey Maid. You can even earn the rebate again on a second shopping trip too in case you need to buy graham crackers more than once in the next few weeks. 1.) Bring the whipped topping to room temperature and stir in the peanut butter until completely incorporated. 2.) 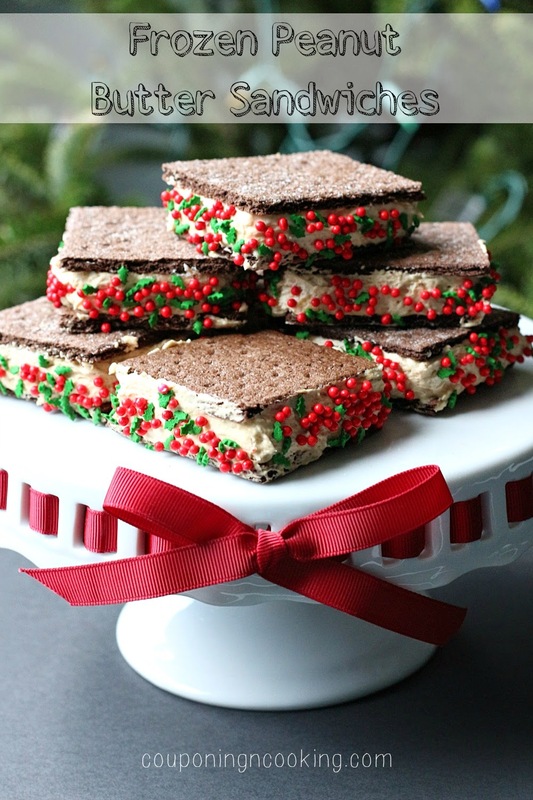 Using an ice cream scoop, scoop the mixture onto one half of a graham cracker and top with the other half. 3.) Optional: Add some sprinkles to the sides of the sandwich. 4.) Place on a baking sheet and freeze for at least 3 hours before serving. Can be stored in the freezer in an airtight container for at least a week, maybe longer. When it comes to the holidays, Justin and I love entertaining. We always host a huge annual Christmas party for family and friends but we also like to just have our families over for dinner or desserts throughout the season too. Our families love spending time together- like spend three straight days together still want to see you more than that love spending time together. We tease my mom because every year she says the only thing she wants for Christmas is to have her whole family under one roof- sounds corny but she actually says that every year. The one thing that keeps me from having people over more often is time. And my hatred of doing dishes. And the fact that between our party, baking for gifts and making dishes to bring to other people's parties the last thing I want to do is cook or bake again. 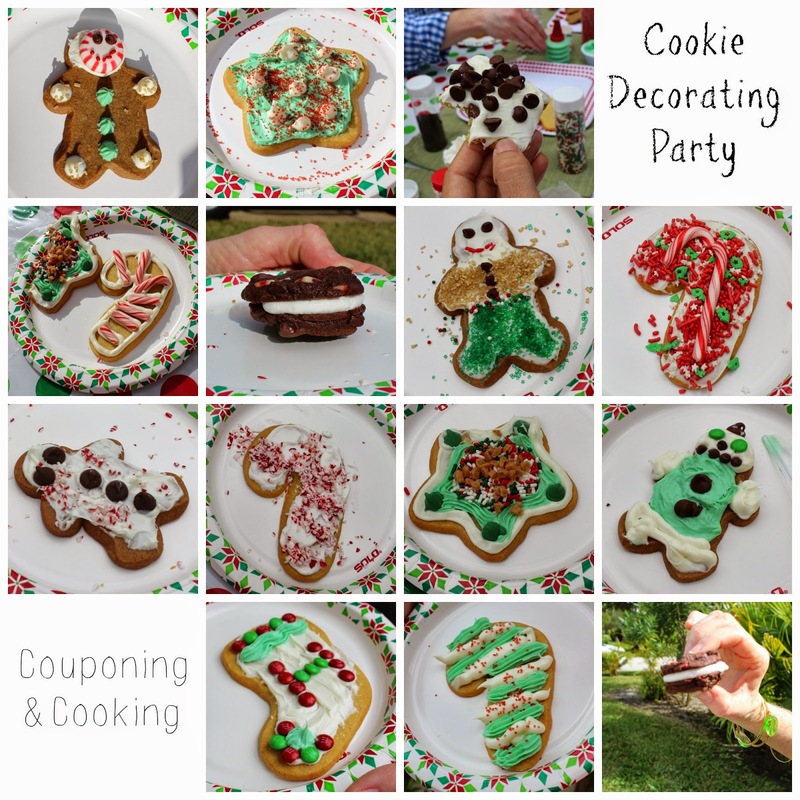 Every year I want to have a cookie decorating party but then when I think of the process of making sugar cookies and gingerbread men, I convince myself that next year will be better. This year things were different. Both my brother and my cousin Rob were in town for Thanksgiving this year as well as my parents, sister and her husband, Justin's parents and a few of our aunts and uncles. I knew that I needed to get it together and have everyone over. I've mentioned before that our family is competitive and cookie decorating proved to be no different. When I was at Walmart doing some Thanksgiving shopping earlier in the week, I saw that Toll House has new Rolled & Ready Sugar Cookie Dough Sheets and I had to give them a try. The idea that I could have tons of sugar cookies and gingerbread men without the hassle of making and rolling out my dough thrilled me. I also grabbed a Stouffer's Lasagna, Nestle Toll House Dark Chocolate Peppermint Refrigerated Cookie Dough, Toll House Semi-Sweet Chocolate Morsels and some other things for dinner and cookie decorating. I will admit that I was skeptical about the Rolled & Ready Cookie Dough Sheets but they worked perfectly. I took them right out of the fridge and used my own cookie cutters to make shapes and gingerbread men and they baked up in about 7 minutes. The whole process was so easy and Justin was thrilled that I didn't have to take out the rolling pin or cover our kitchen island in flour. 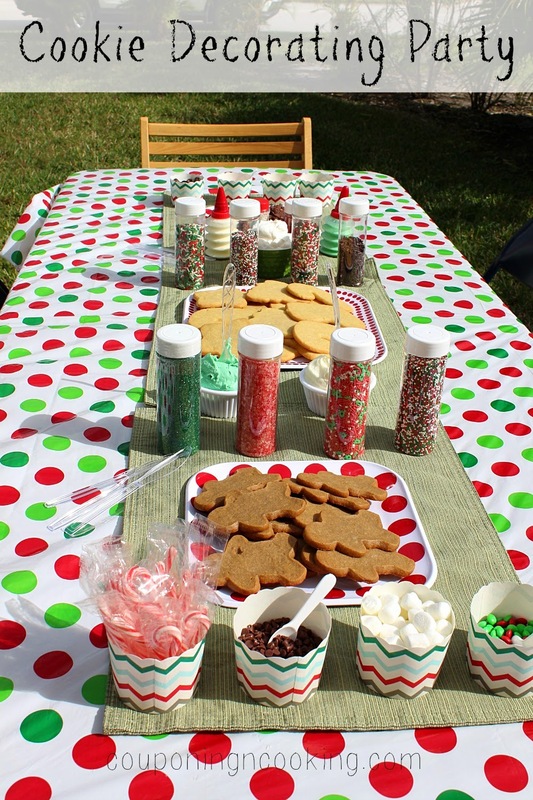 For the cookie decorating I set up a big table on the back porch (living in Florida means you do things like decorate Christmas cookies with sunglasses on) and used all disposable plates, icing knives and a plastic table cloth. My family's competitive nature also means that they tend to do things like spill sprinkles every where and cover everything in sight with icing so it was a good thing we were outside. 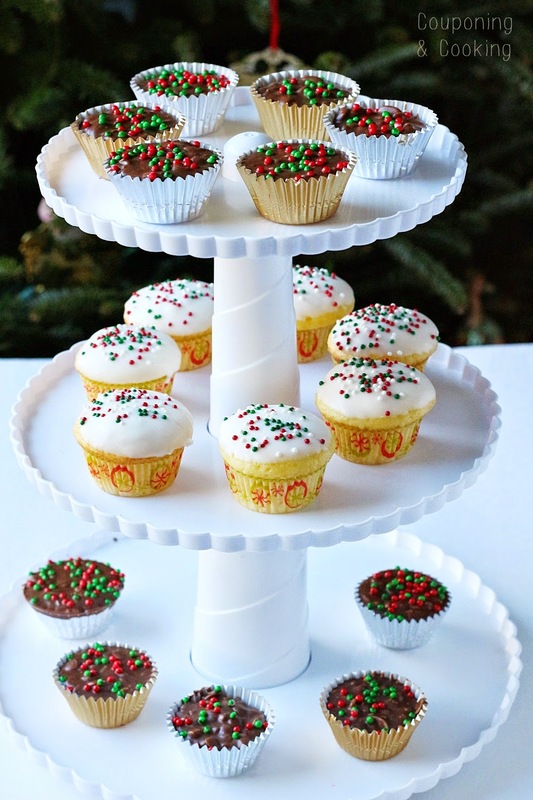 I used holiday paper snack cups for all the decorating items which also cut down on the clean up. I put out things like Toll House morsels in various sizes and flavors, sprinkles, marshmallows, Christmas candies, toffee bits and more. I went with canned icing and even bought the pre-colored ones so that I didn't have to do it myself. For the Toll House Dark Chocolate Peppermint Cookies I made a little homemade Peppermint Mocha Whipped Cream using holiday coffee creamer so people could make mini cookie sandwiches (which were amazing by the way). 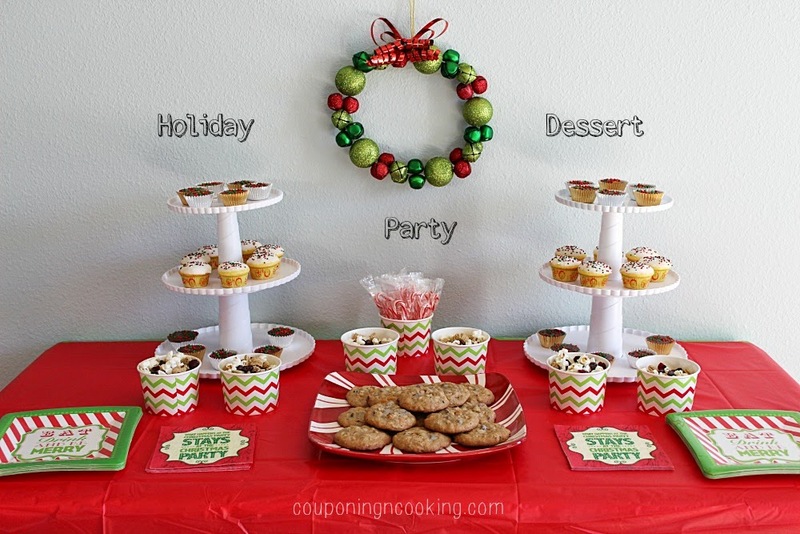 Do you host any annual holiday parties? What is your favorite way to decorate Christmas cookies?